Opera's golden couple celebrate 20th anniversary of their first meeting. 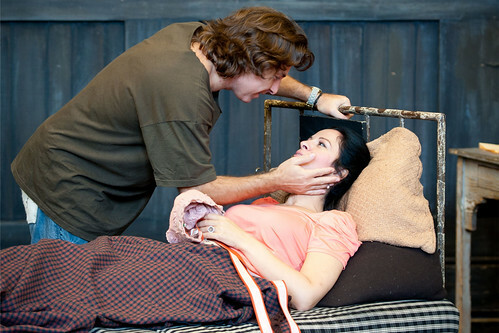 Angela Gheorghiu and Roberto Alagna mark the 20th anniversary of their meeting by singing together in John Copley’s production of La bohème this evening. 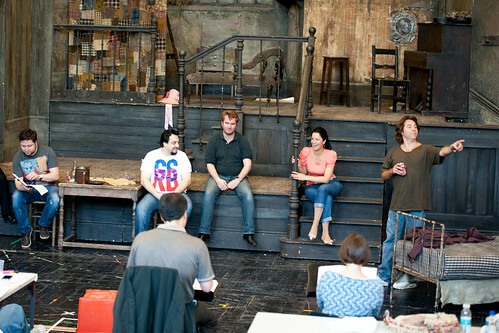 The couple first met at the Royal Opera House in 1992 when performing in the same production. Four years later they married in a ceremony on the main stage of the Metropolitan Opera. 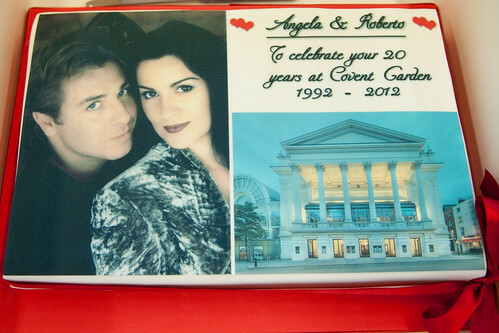 The couple celebrated 20 years since their meeting with a special cake sent in by a fan which they shared during Friday’s rehearsal. 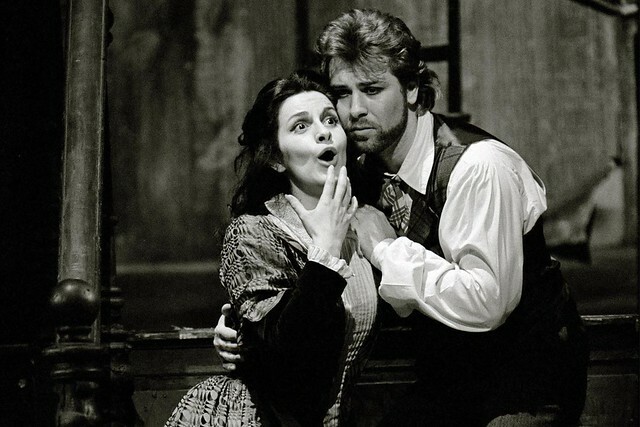 Angela, who made her international debut in the 1992 performance of La bohème, shot to fame in 1994 following her electrifying performance as Violetta in Richard Eyre’s production of La Traviata, the same production in which she sang alongside Roberto for the second time with The Royal Opera in 1996. This season, Angela's performances in Faust, Adriana Lecouvreur and Tosca were broadcast across the world as part of the Royal Opera House cinema season. Next season, the Romanian soprano will perform the role of Magda de Civry in Nicholas Joël’s production of La rondine. Roberto’s career also took off at the same time, following his acclaimed performance as Roméo in Nicolas Joël’s production of Roméo et Juliette in 1994. Next season, the French-Italian tenor will sing the role of Nemorino in Laurent Pelly’s production of L'elisir d'amore. Je voudrait ètre une petite souris et vous suivre,merci pour le grand bonheur que vous partager. Congratulations to the happy and oh-so-gifted couple! With great originality, I will say, "Wish I were there!" You are so talented and beautiful! well done you both are talented and so beautiful! Felicitarile mele si mult succes in continuare aici la Londra. A great evening, thoroughly enjoyable. Totally loved the curtain debacle. You should do all set changes with the curtains up from now on, that made the evening really special! In addition to the comments above, it was super to see such a great production still going strong after all these years. The full frontal set changes with the curtain up was an extra bonus. My first visit to the ROH since I was about 13....many, many years, in case you want to know! I was speechless, it was a stunning production, in fabulous surroundings. Loved the fact that we could see some of the scene changes too! Loved every second of the production, the chemistry between Roberto and Angela electrifying. Can we have more operas with these two in please?? Yes I agree - it's been years since they appeared together in London and it would be so wonderful to see them in other operas. Manon Lescaut, Otello, L'amico Fritz soon please!!! Superb in every sense! @John-I love to see them in Manon Lescaut and L'amico Fritz.Please!!!!!!! Congratulations, Angela and Roberto! I look forward to Saturday's performance! Or what about Louise? It would be such a perfect role for Gheorghiu and hasn't been done in donkey's years! Once again fantastic performance on Saturday, felt that I was witnessing a part of opera history. Thank you ROH.